From Kobe JAPAN to the world. 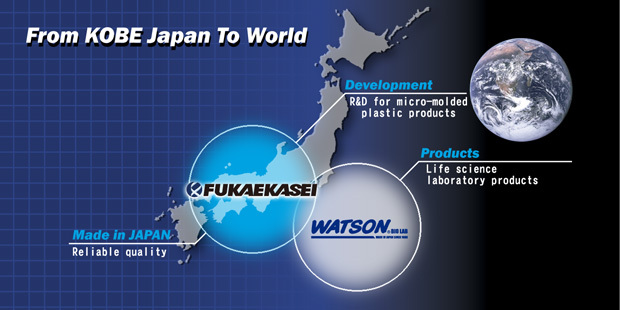 FUKAE-KASEI and WATSON Bio Lab are the leading company of life science laboratory experimental consumables in JAPAN. In the modern wave of dramatic innovations, what is required for us is to have sensitivity to understand what is being requested and far-sighted vision for the future. Therewith the above, we have renovated our head office plant into a clean room and advanced into nano technology fields and up until today our WATSON brand has supplied reliable products manufactured in our clean rooms. Also we have been moving forward our R&D efforts to develop new technologies and products such as mass-production of plastic products molded in nano scale and various plastic disposables for life-science. We also take active approach to develop new plastic products in medical, science and other industries in the total process from planning and designing to delivery. Here is our promise to make our best efforts looking at the future so as to leave our name as great contribution to the society. WATSON Ｂio Lab USA is a leading manufacturer of plastic products for biotechnology and life science research in USA. Our wide range of product line includes micro pipettes / pipette tips / filtered tips / microcentrifuge-tubes / centrifugal tubes / cell counter plates / preservation plates / cell culture products / PCR products / racks etc. Since the launch of this brand in 1988, our R&D and manufacturing operations have been meeting the demands of researchers and earned wide patronage. Our products are manufactured in clean rooms free of DNase / RNase / Pyrogen and delivered to our customers after product inspections under rigorous quality control system. It is our wish to contribute to life science in the world through our pursuit of excellence in usability, quality and cost performance. 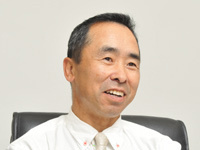 It is also our wish that our Japanese-quality WATSON Bio Lab brand products born from our own experience and wisdom will make contributions to your laboratory work.